Kids get to go on exciting journeys with Dora the Explorer and her friends and learn a lot along the way. Dora is an adventurous young girl who likes nothing better than to take outdoor journeys to find lost items or help those who find themselves in difficulty. She is accompanied by a few friends who provide assistance. She also treats the young audience as friends and communicates with directly, frequently asking for their help in her travels. Dora teaches kids problem solving skills and also beginning Spanish, often repeating (and asking them to repeat) simple words and phrases. Dora’s companions (besides the audience) include Boots, an enthusiastic monkey with a high level of athletic skill and agility and a talking backpack who contains a vast array of items, from which the viewers must identify what will help Dora the most in any given situation. Also along for the ride (literally) is Map, a talking map that displays the path Dora must take in order to reach her chosen objective. Sometimes viewers must also help Dora choose the best path in order to get where she needs to go. 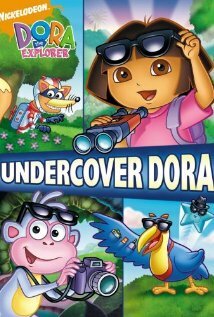 Besides natural obstacles, sometimes Dora encounters deliberate interference in the form of Swiper, a fox who lives for nothing else but to sneakily steal items crucial to Dora’s quests. However, with some help from the viewers, Dora can usually prevent this from occurring. Besides learning about the Spanish language and choosing the best solution to a problem from available choices, Dora also encourages a positive outlook on life, as she will help anyone who is in need of it, even Swiper, if the situation calls for it. She rarely gets frustrated and always keep a cool head and upbeat demeanor. She enjoys music and sports as well as her already active lifestyle. She also enjoys a strong relationship with members of her family. 15 October 2003 - Season 3, Episode 8: ¡Por Favor! 14 October 2002 - Season 2, Episode 13: Super Map! 18 November 2002 - Season 2, Episode 15: ¡Rápido, Tico! 19 May 2003 - Season 2, Episode 24: Quack! Quack! 30 September 2013 - Season 8, Episode 6: Verde's Birthday Party! 02 October 2013 - Season 8, Episode 7: Dora's and Sparky's Riding Adventure! 29 August 2012 - Season 7, Episode 12: Vamos a Pintar! 29 November 2012 - Season 7, Episode 21: ¡Vamos a Pintar! 14 January 2012 - Season 7, Episode 22: Dora Rocks! 14 January 2013 - Season 7, Episode 23: Dora Rocks! 15 November 2010 - Season 6, Episode 2: Happy Birthday, Super Babies! 16 October 2003 - Season 3, Episode 9: What Happens Next? 29 October 2003 - Season 3, Episode 16: Boo! 21 April 2004 - Season 3, Episode 21: Louder! 26 May 2003 - Season 2, Episode 25: Whose Birthday Is It?